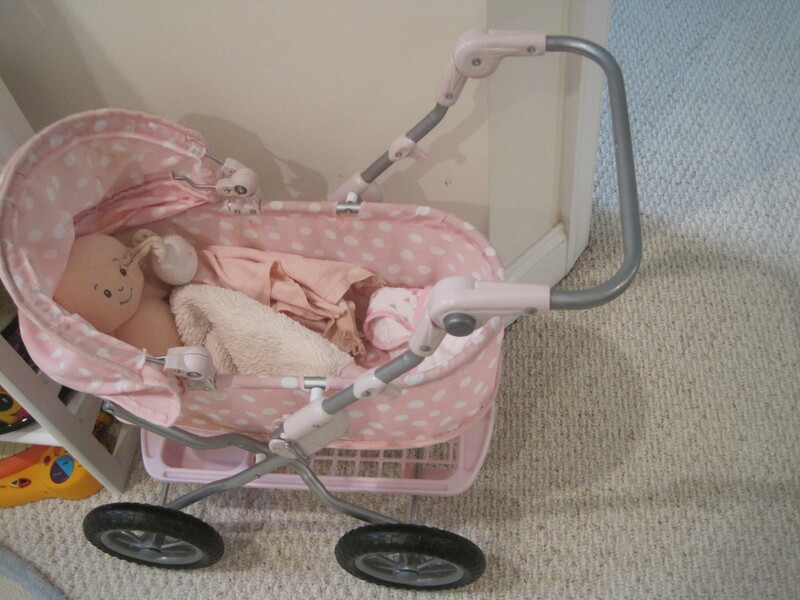 My babies have grown and, likewise, our toy storage and display needs at home have changed as well. 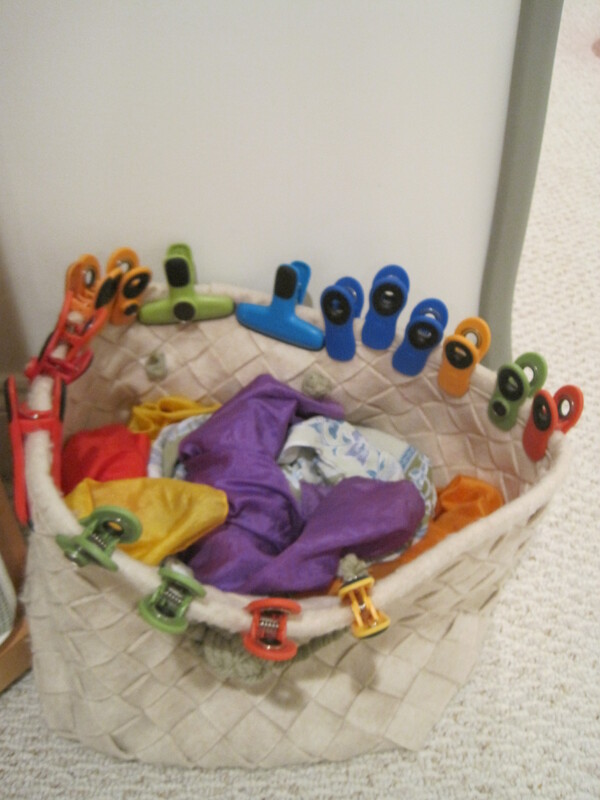 Like many other Intelligent Nest families that have been rotating toys for years, we have noticed that toy rotation is less effective with older children as their more advanced memories, developed preferences, sophisticated abilities to draw connections and enhanced mess-making skills, coupled with increasing abilities to help clean-up, call out for a new style of toy storage and display. 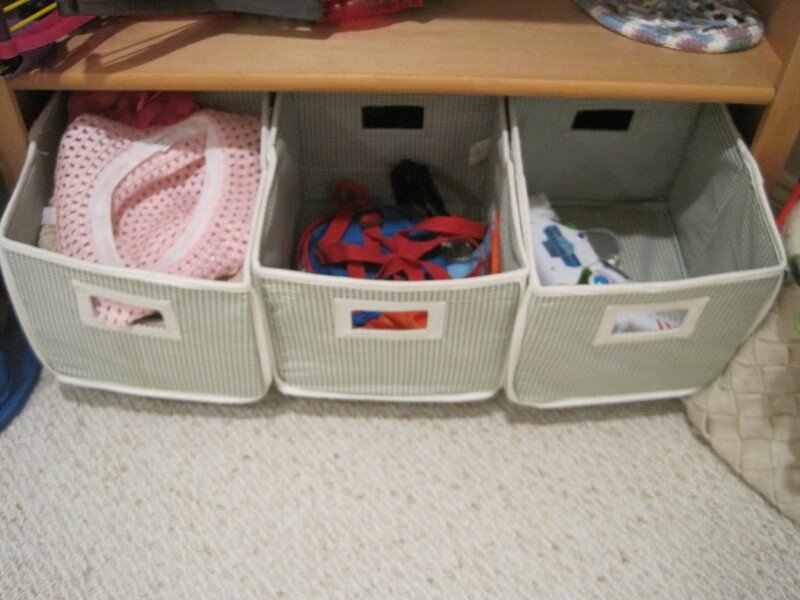 And I have good news, toy storage, organization and rotation is much simpler with older children. But, it does require an upfront time commitment to create a system. As you know, we bought our first house this summer and with that came the opportunity to design a fresh system of toy storage and display for older children. I like to think of our home as a work in progress and am excited to share some of our solutions with you. Please keep in mind that our solutions may work for us, but may not be ideal for other families. This article is meant to offer suggestions, but not a right or a wrong way to do things. You’re the expert at your house! Elementary-aged kids have bigger bodies and a great need to less-loose and run wild- especially when friends come over to play. 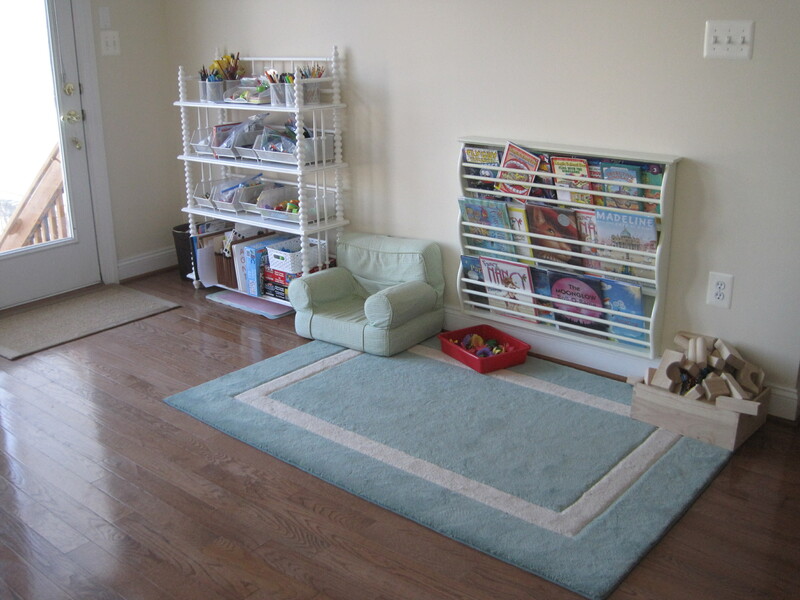 Keeping a large space clear of hard & small toys can enable children to use the space, think creatively and engage their entire body in learning. 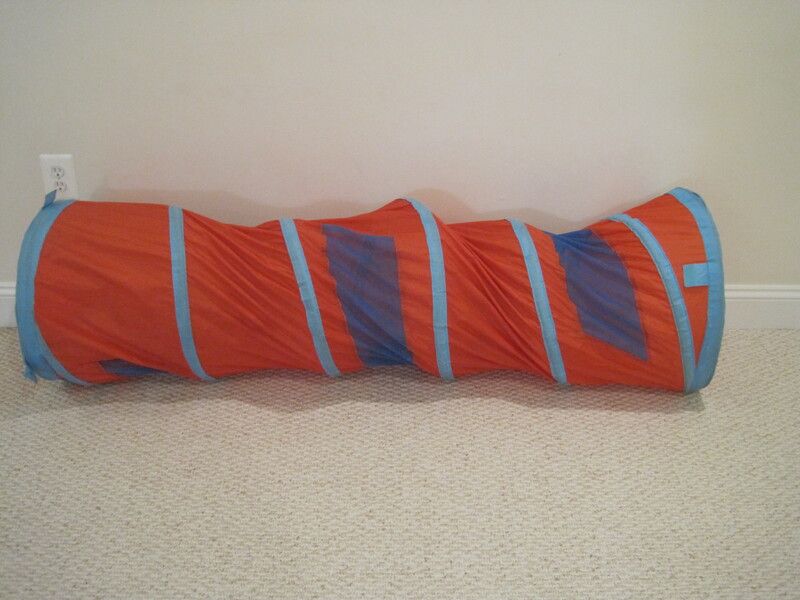 Instead of keeping imaginative-play items in the playroom (dolls, kitchens, instruments, blocks, trains, etc…), find items suitable for gross motor play like soft balls, play swords, sheets, scarfs, collapsible tunnels, pillows, stepping domes, large stuffed animals, etc… In this photo you can see a intertube with poles called the “Jungle Jumperoo”. 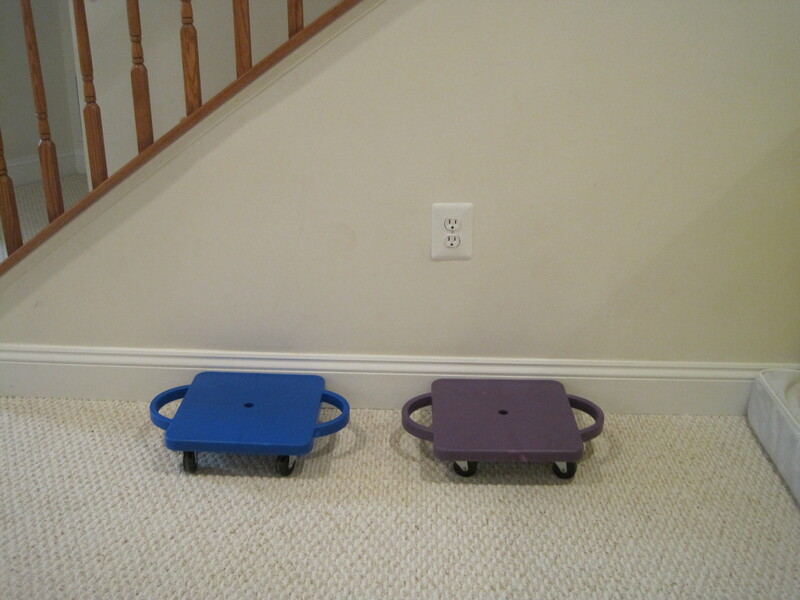 I like it because it takes up a very small amount of space, is safer than trampolines and can be enjoyed by everyone in the family (great cardio workout!). 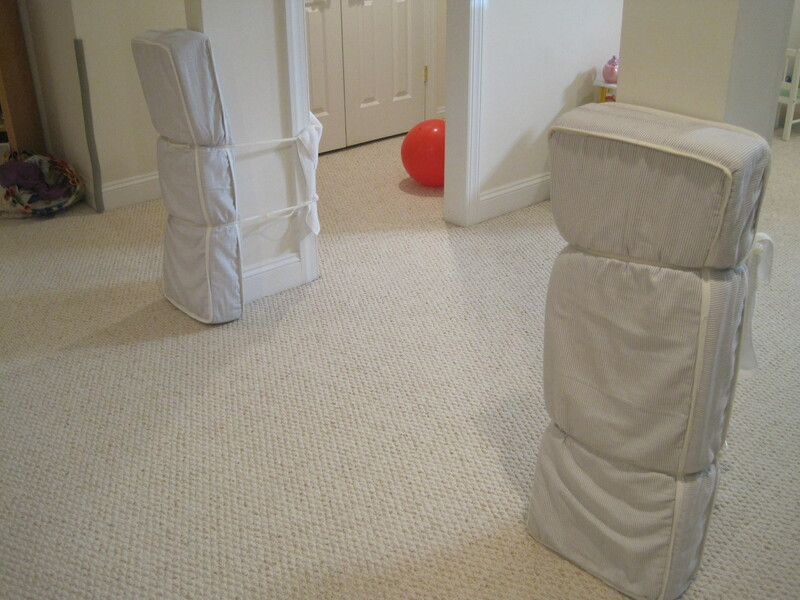 To make our playroom safe for rough play without constant adult supervision, we added some padding in areas that might be problematic. 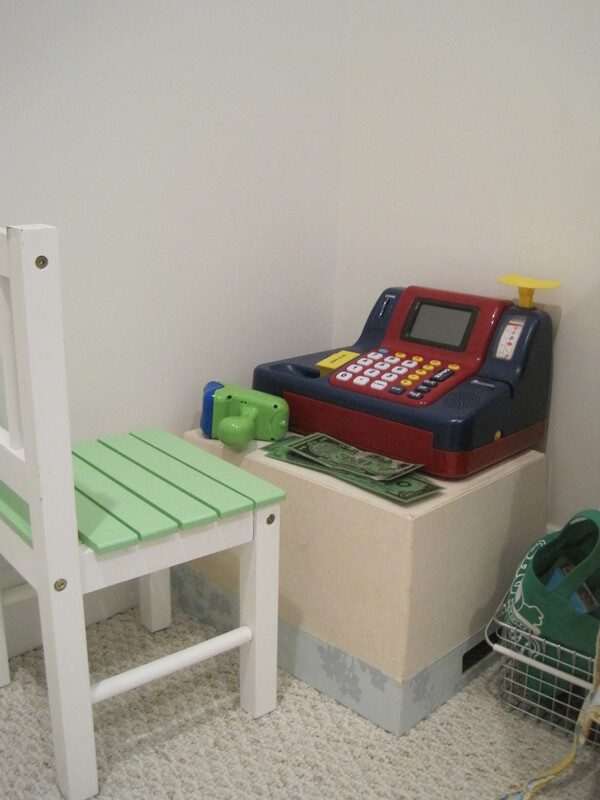 For instance, corners of walls, support-beam pillars and furniture in the “rough play zone”. I also ensure that any hard toys are stored outside of this designated area so that we can say “yes” to rough-housing and avoid the pressure to helicopter our kid’s playdates. In the photo below, I took parts of Jack’s old toddler mattress from IKEA and used it to pad the support beams. Here is an example of items that I have found to be safe to store in our designated rough-zone: dress-up clothing (cloth only- no shoes, jewelry, etc…), play weapons (soft models only of swords, Nerf guns, bow & arrows), stepping domes, ball bag, scarves (clips around the scarf bin are for connecting them to create forts). Adjacent to the rough-zone, I have an imaginary play nook that is open to the rough zone, but set apart and designated as no-rough-playspace. 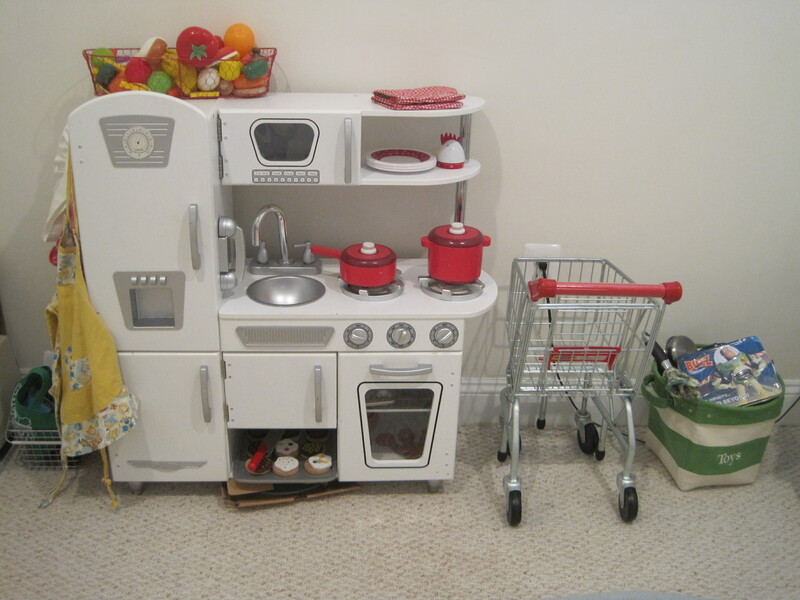 Elementary aged kids still enjoy playing dolls, music, blocks and kitchen, although you can expect that they will be used slightly less than before. 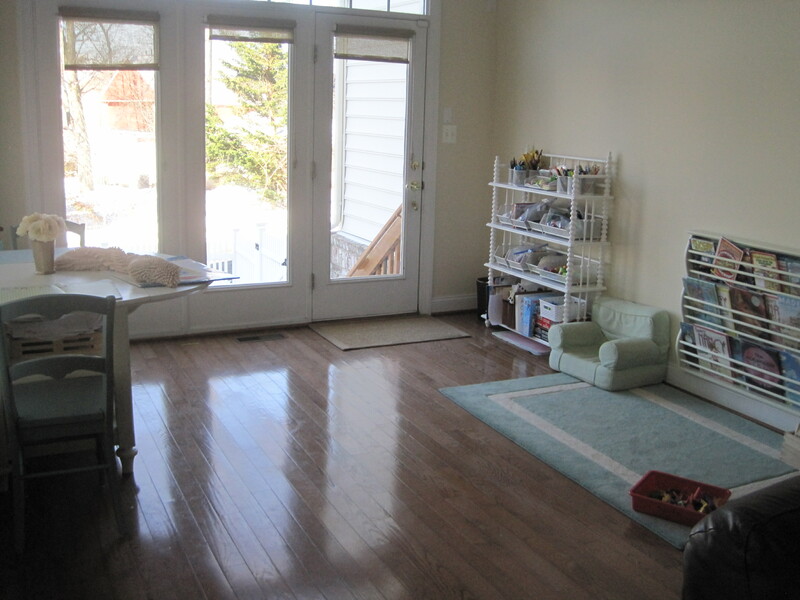 When children are very young, I typically limit how many toys that I stock in an imaginative play area, but as children grow they become increasingly able to clean-up bigger messes and become less overwhelmed/over stimulated by large quantities of toys. I also do not rotate toys in this nook regularly any longer. I will occasionally clean up and display toys or rearrange the center (1x a month). They love when this occurs and will play for hours when I make the effort, but it is not necessary to do so weekly to encourage their exploration anymore (hurrah!). 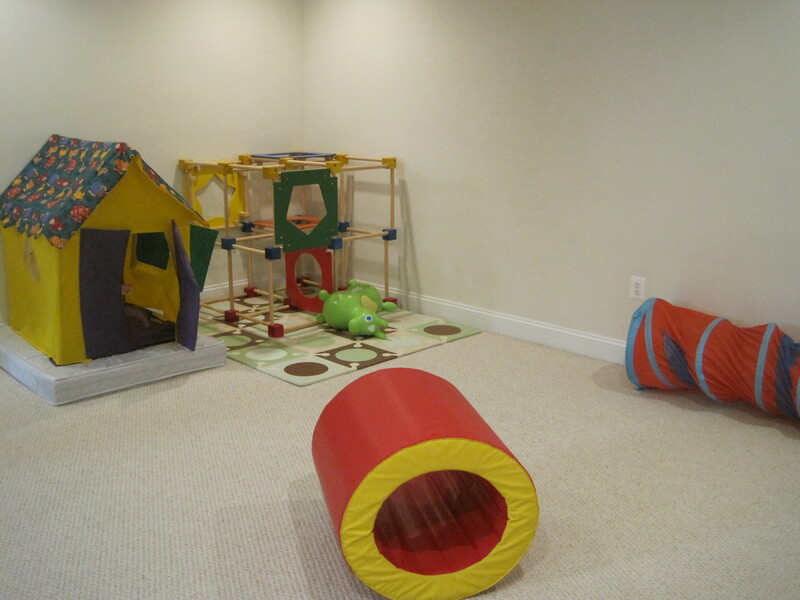 The rest of the playroom has a couple of gross-motor toys lined up against the wall like a tunnel, scooter boards and a play climber. We also have a collapsible playhouse pictured. 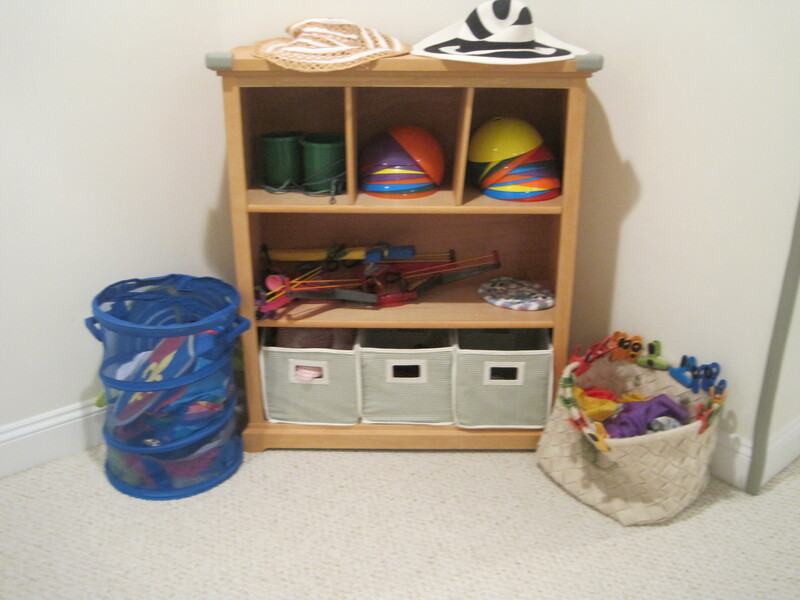 Try to limit how many gross-motor toys are displayed at any time and keep them up against the wall and spread out around the room while choosing one toy to feature in the center of the room for rotation. I do this only when we clean up once or twice a week. 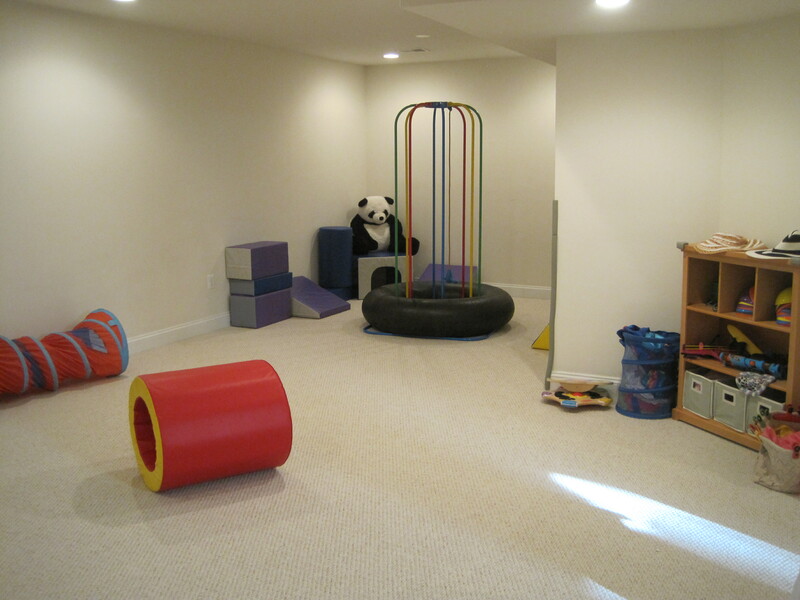 Usually, the basement is a total disaster and can still be used and enjoyed in the this fashion (thank goodness!) by older children. 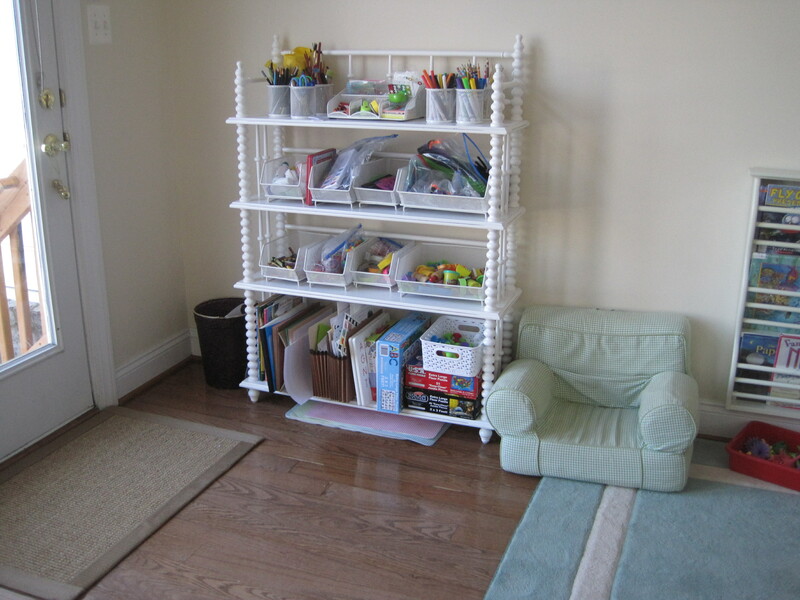 Again, mess becomes less overstimulating to the older child and in some ways can fuel creative play. Please note, that all-purpose toy boxes are still not used or appropriate for elementary-aged children. The only other designated kid-zone in the elementary-aged household (besides their bedrooms) is the “workspace”. 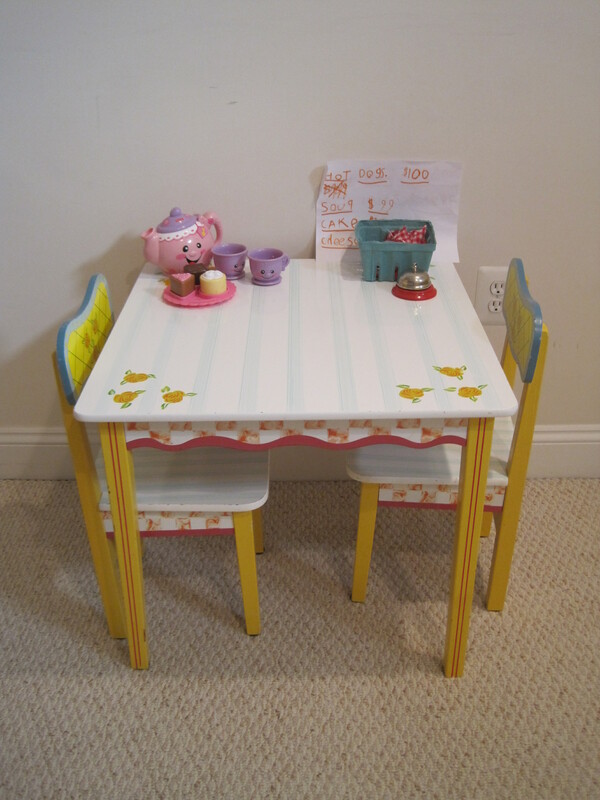 Having a designated workspace away from the kitchen table can be helpful to enable independent work on homework, complex educational toys, puzzles, projects, reading and art. Notice that all art supplies and clean-up materials are made 100% available to the children. Nothing is hidden away in drawers. Elementary-aged kids a great capacity for memory and independence problem solving skills, but still not always well-enough developed to be able to think creativity about supplies that are out of sight. 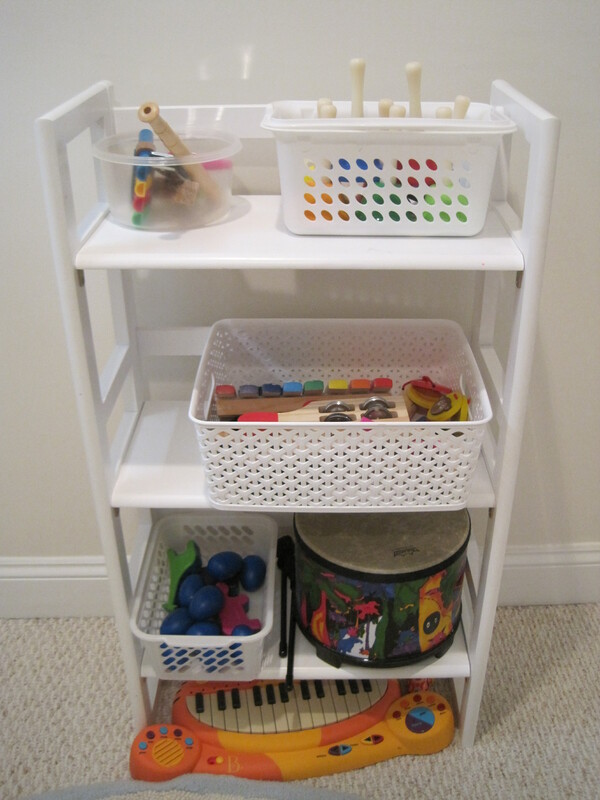 Children are expected to use the organizers on the shelves to maintain order and regulate the use of the more expensive and messy supplies. Messes are OK, but must be cleaned-up. 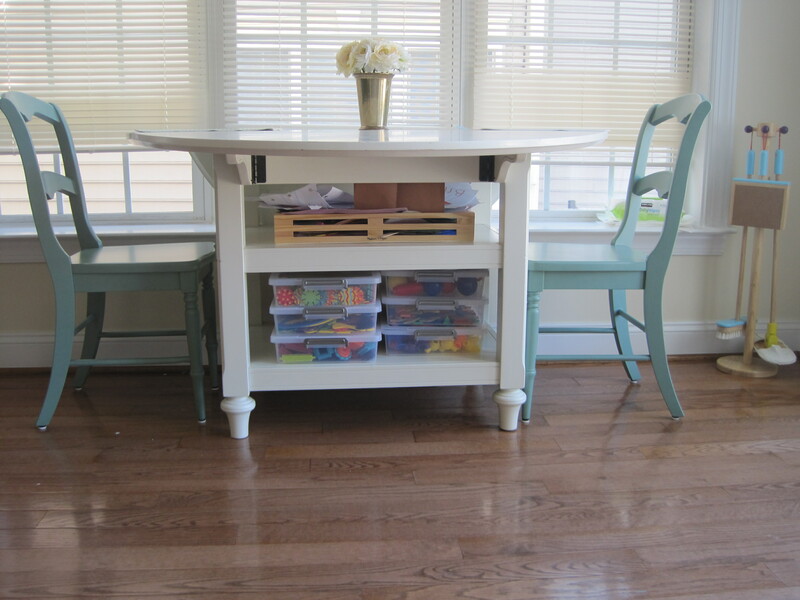 Keeping this area set apart from the kitchen table enables less frustration over big messes and ongoing projects, plus it enables the child to take responsibility in their designated kid-space. 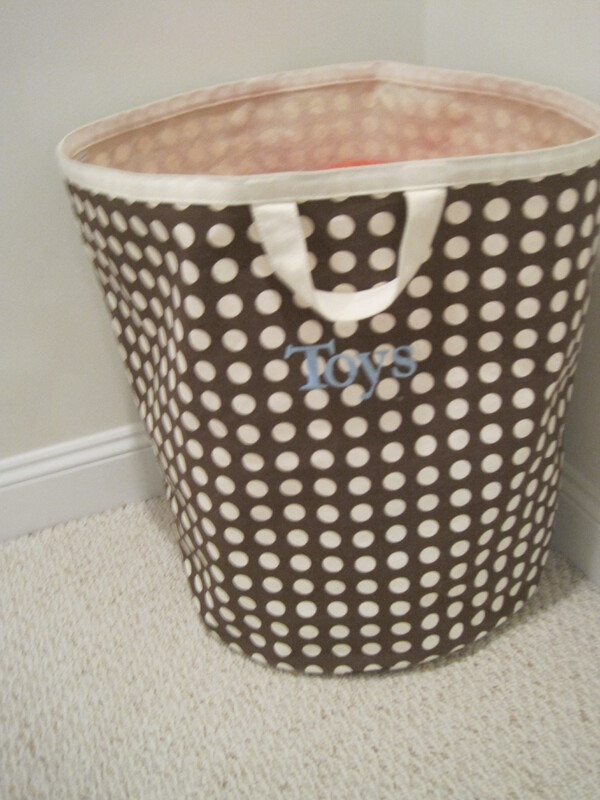 We rotate an educational toy/manipulatives weekly in a bin and display them the worktable or rug. All the manipluatives are stored under the worktable to make rotation quick and easy. Soon, I’d like to add a art display wire to the wall so the kids can hang up their masterpieces. One day at a time!